Spray 4-quart slow cooker with cooking spray. In slow cooker, mix tomatoes, broth, onion, garlic, sugar, salt and pepper. Cover; cook on High heat setting 3 hours or Low heat setting 6 hours. Add whipping cream. Cover; cook about 15 minutes or until hot. Stir in basil. Meanwhile, spread one side of each bread slice with butter. Sprinkle 1 tablespoon Parmesan cheese on top of buttered side of each slice. Press gently to adhere cheese to bread. Heat 12-inch skillet over medium heat. Place 2 slices bread, buttered side down, in skillet and top each with half of the Cheddar cheese. Place remaining 2 slices of bread, buttered side up, on top of cheese. Cook 5 to 7 minutes, turning once, until golden brown on both sides and cheese is melted. Cool 5 minutes; cut each into 1-inch cubes. Serve with soup. If you like your tomato soup smooth and want to blend it, just let the soup cool 15 minutes before blending. Fill blender one-third to half full of tomato mixture. Remove or loosen center cap from lid of blender. Cover lid with folded dish cloth, and hold it down when blending. Puree until smooth. If you like your soup slightly sweeter than this more “grown-up” version, just add another tablespoon or two of sugar until you get to the desired level of sweetness. Is there a more nostalgic food than grilled cheese and tomato soup? We don’t think so. This kid classic gets an adult upgrade with fresh basil and cloves of garlic, turning traditional tomato soup into restaurant-worthy tomato-basil soup. This recipe is made completely from scratch but the slow cooker takes all the intimidation out of the cooking process. And we wouldn’t dream of giving you a tomato soup recipe without a ooey, gooey grilled cheese sandwich to dunk with. 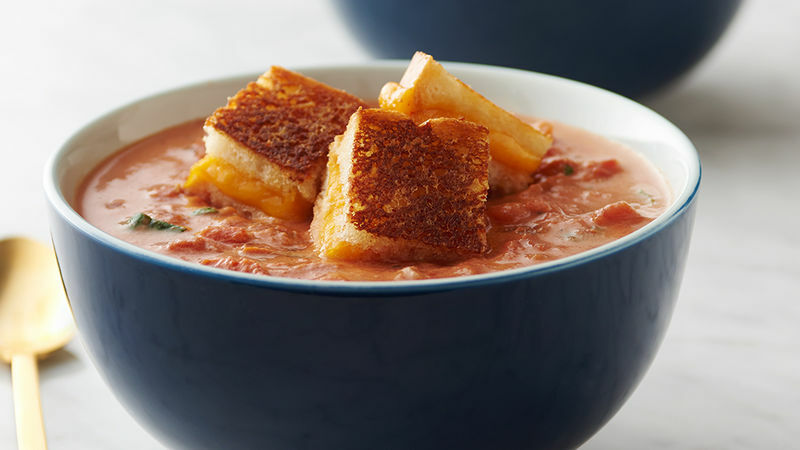 These grilled cheese croutons go directly in the soup and are perfectly spoonable so you don’t have to get your hands dirty. You can put them in any type of soup, too because really, what soup doesn’t pair well with bread and melted cheese?